Medical Program: Can Listening to Music Improve Your Health? We’ve heard great things about music before, all the different impacts of health. It could be a baby listening to Mozart. Studies have been done about that. But what is the role of music, and can music really help you in your overall health? Hi, I’m Dr. Brian McDonough, and welcome to Primary Care Today on ReachMD. My guest today is Dr. Kenny Fine, and we’re going to talk about music and whether music really has the cure for what ails you. Dr. Fine, welcome to the program. Well, thank you very much for having me. I guess my first question: There’s a lot of studies, a lot of work done looking at music and its role. Tell me a little bit about it and your interest in it. I have been active in being what I call a physician-musician on a mission for about 15 years, and it was really my passion and my kind of feeling of destiny that this was part of my profession. I would say the studies kind of came along after that. So, I kind of backed into. And then it was one of those things that my intuition told me this would be a good thing to do, and then lo and behold, the studies proved that, yes, music really is a healing force. Well, Dr. Fine, it’s interesting… And by the way, if you want to know, his background is that he’s held positions at Baylor University, University of Texas Southwestern. You’ve done medical research, and it’s been in journals, and you’ve done things for almost 30 years. But what I’m interested in is, you came at it from a passion. When you research something or evolve to something that’s as a result of your own personal passion—for our physicians listening in the audience—that’s probably the most organic and great way to do it. Yes. And truthfully, I think that could be a general recommendation, not only for professional pursuits and success… And truthfully, if you look at the habits of successful people, they do that. We’ve heard all about billionaires who dropped out of college because they had an insight or a passion or an intuition into a certain thing, but I really relate creativity and definitely happiness as one of my, what I call, 6 tenets of finer health, that if somebody really wants to have optimal health and happiness, that they really have to allow creativity to blossom through their personality. And frankly, the final element of those 6 is a spiritual health, and I do believe… I happen to be the kind of person that I believe we have connection with the Divine, and if we can listen to our destiny and our insight to go forward from a Divine source, then I think you can do nothing but succeed. By the way, if you are curious in finding more about Dr. Fine, he’s actually, as he says, a physician-musician. He recently recorded a double album containing 26 original songs called Rockspirational. And really, you have made music a big part of your career, made it a big part of medicine. There are certain things that I wanted to ask you. One of them is, for instance, if you like music, does it matter what kind of music you listen to as far as having a healing property for you or making you feel better? Well, in fact, it does. That has been studied with a method they call behavioral kinesiology. It’s a little bit of a crude method. People have probably heard about it. Maybe you’ve gone to a functional or alternative medical practitioner and they’ve had you raise your left arm and they test the strength of your arm with certain stimuli, but when people are exposed to classical music, that seems to be—there’s something about that vibration, if you will, that seems to strengthen people’s light force and their measurable strength, whereas music that has what we call a syncopated beat… and I believe it’s because our rhythm is appropriated by our heart. So, heartbeats are supposed to be regular and rhythmic, and when we listen to music like rap or any kind of music that’s not beating rhythmically, it has a weakening force on us, actually. It is really interesting that these studies have been done. How long has research like this been done? Has it been going on for decades, years, centuries? How long have we been studying this? Well, I think it‘s really more recent, in the last 10+ years, in a field that came kind of in reverse out of what we would have called in the past music therapy, and that’ still used today. Music therapy is somewhat of an occupational therapy where a patient, or children who are patients, they are playing instruments, they are doing music; maybe a stroke patient is trying to recover, and so they might go to what we call music therapy, and they do the action. But there now is something we call therapeutic musicians where musicians come and play music, sing, play violin, something soothing for a patient in an ICU, in a bone marrow transplant unit, maybe in settings where there is anxiety, like mammogram units and things, and that’s only really, I’d say, developed officially and formally over the last 10 or 20 years. .
Physician-musician on a mission is Dr. Kenny Davin Fine, creator Oro-Intestinal Fitness Products, an academic gastroenterologist. He’s recorded 11 albums. Let’s say we look at somebody singing and they’re not great; they’re just singing in the shower. Does that count as therapy? Well, that person would only do that… And truthfully, I kind of take my observation of people doing karaoke and how popular it became in this country once it was introduced as a technology—came out of Japan I believe—and just watch somebody. Now, unfortunately, we’ve tended to put that modality in bars more often than anywhere, and so people are obviously lubricated with alcohol; and sadly, I think, that may not be the healthiest environment to put this concept. In fact, I have a new program I call Sing If You Want To, which both at my music concerts and in my upcoming health venues, there will be a support, an invitation for people to sing if they want to. But no, it doesn’t have to be formal, you don’t have to be trained, and you certainly don’t have to be good for that action to uplift your spirits and therefore your life-force. And I definitely tell anybody that has a passion to sing, sing every chance you get. 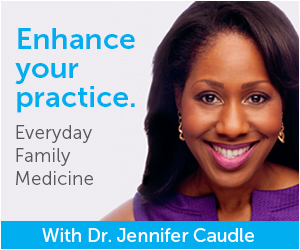 You’re listening to Primary Care Today on ReachMD. I’m your host, Dr. Brian McDonough, and with me is my guest, Kenny Davin Fine. We’re talking about music and how it can play a role in care. We have family practice doctors that listen to this program. What sort of things would you suggest they take advantage of with music, and how would they help their patients? What are some examples? Well, to tell you the truth, I have had a few examples recently where… It was actually a practitioner now that I think about it who uses my medical laboratory. I kind of came to be known publicly, frankly, for being the doctor that brought gluten sensitivity to the world, and I did that through a testing lab called EnteroLab.com, and it’s a very unique method of testing for gluten sensitivity in stool specimens, so I have a lot of practitioners that refer their patients to that source of testing. It is online, as I mentioned. And so, she was honest to admit that she… First of all, you don’t have to be a nonprofessional to suffer from anything, much less gluten sensitivity, which is now so common—practitioner, medical doctor, whatever, to be prone to that. And she talked about depression, for example, which is one of the side effects or consequences of gluten sensitivity and intestinal issues, and I happened to mention to her that there are ways, obviously, to combat depression besides just drugs. And being in natural light is the best, in my mind, being in nature, but being exposed to uplifting music. And everybody, I think, who’s ever been a runner or an athlete that listens to music—maybe you’re in the gym—we’ve experienced how you can have a stimulation of strength, of exertional energy, of performance, or just joy by the music you listen to, so by all means I think there’s enough evidence through… And again, I’m not the kind that if it hasn’t been studied, it hasn’t been proven, but I think we have the studies to prove that this is a healing modality, including for anxiety and for healing after procedures, probably for longevity, because we certainly know that classical music conductors usually live into their high 90s, even probably professional musicians where they’re so exposed to the musical vibration all the time that they live a long time. And they’re the happiest people I’ve ever met, quite frankly, because I work in the studio with very esteemed musicians—mostly men, but women too—they’re just so happy. And we have a problem with that in society because antidepressants are the number one prescribed drug in our culture. So, what I call it is happiness restoration, and I believe… And truthfully, I wasn’t born happy. I have to work at it, like a lot of people, and my music and performing music and helping people and bringing goodness and joy to the world, that is indeed something that makes me greatly happy, and I give others a chance to try that too. Dr. Fine, we only have a few more minutes, but I wanted to ask you: Can you share an example of music therapy in a time when it did make a difference with a patient? Well, it has been very well-known that dementia patients and elderly patients especially are very responsive to outside stimuli. 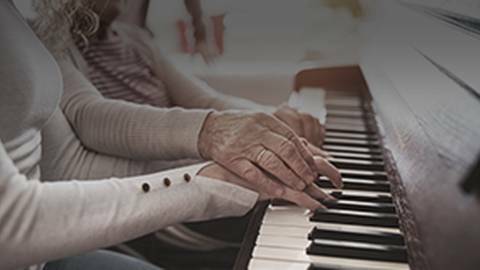 We’ve heard about maybe bringing pets into nursing homes, and there are people who bring music in the nursing home. I happened to do that one time, and it was a patient that I knew, actually—it was a friend’s father—and he had a declining status from Parkinson’s disease, and he hadn’t spoken in like 3 months. And it wasn’t exactly like I was trying to heal him with my music. It was just something I thought to do. And after the first song, which he greatly enjoyed, and so did his wife, I asked his wife if she’d like me to play another one, and he vocalized, “Yes,” like he made a request, a vocal request, and he hadn’t uttered a word in 3 months. And so I would have to say, whether it was just—it reached him in the way that other stimuli didn’t or it had an immediate healing effect or both. It was kind of pleasantly shocking and pleasing that I could see that happening. That’s a great story. I’ve asked you a lot of questions. Anything you want to bring up that I haven’t brought up? Let me just finish in… I kind of gave 3 of these 6 tenets. I happen to be a gastroenterologist with an emphasis on food sensitivity and nutrition, so I think proper diet is very essential for health, I think proper sleep and getting enough sleep, and then really stressing that happiness and love, the energy of love and creativity and some kind of spiritual activity that stimulates our connection to the Divine, that’s my recipe for optimal health. And, of course, if there are practitioners in your listening audience, well, the healthier and happier you are, the more that you can practice what you preach and people will believe you, and it’s contagious. So, I encourage everybody to seek not just the scientific and material aspect of health—certainly that’s important, our bodies, our organs, our cells—but don’t forget the mental, emotional and spiritual aspects as well. Well, that’s a great place to end this interview. Dr. Kenny Davin Fine, I want to thank you for joining us on Primary Care Today on ReachMD. And for those who are listening, if you want to hear this at another time, you can obviously download the podcast, get the information related to Dr. Fine. Dr. Fine, thank you so much for taking the time to join us. Thank you, and we’ll talk to you next time. Country? Hip-hop? Rock or reggae? Whichever it may be, it's sure to hit a high note with your health. Dr. Brian McDonough brings up an age-old question: can listening to music cure your ailments? In an attempt to put this long-lived discussion to rest, Dr. McDonough welcomes Dr. Kenny Fine, a physician-musician of 15 years.